I know, I almost did a double take, too. 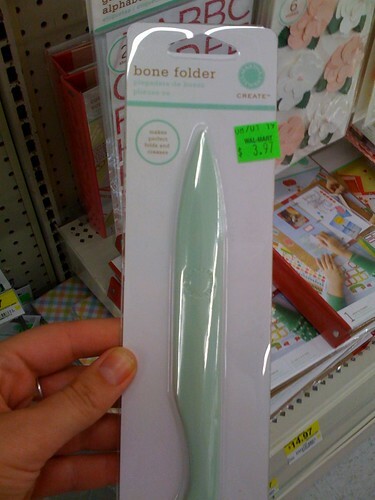 Yep, it turns out Miss Martha is now selling part of her paper-crafting line Martha Stewart line at Wal-Marts across the country. I stopped by my local store to see what it was all about. Overall, not that much different that the selection at Michaels besides the tools being green (they’re cream at Michaels) and a dollar or two difference. I was glad to see her paper packs tend to be bigger (invitation packs with 40 invites), but honestly, collect those Michaels coupons and get a better deal. The big thing about this collection appears to be the better selection of stickers. 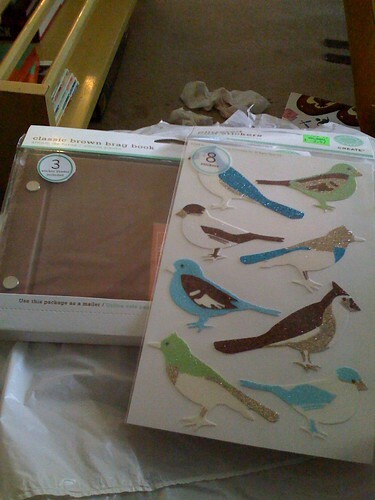 I picked up some great glittery bird stickers, and I could have gone home with more. I also picked up one of Martha’s “brag books.” Not sure what I’m going to do with it yet, but the stickers look pretty damn good on it. Now in green and a few cents cheaper! Did Michaels change the policy of accepting the 40% off coupons? When the line first came out, I know that you couldn’t use the coupon on her line. #1 Isn’t walmart the antithesis of DIY? #2 Why would you promote a compant that destroys more jobs than it creates while burdening public health care programs? Not to mention exploiting the heck out of their employees? 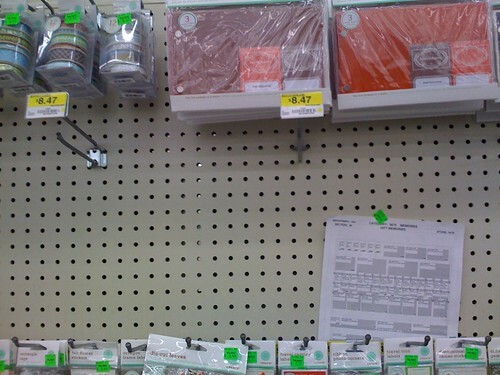 Ginny — Michaels does allow you to use coupons on MS stuff now. 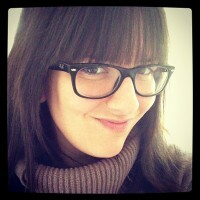 And yep, this is a recent change. Mary — Thanks for the feedback. Our point with this post was to simply talk about the new Martha line, not promote anything. But I’m glad this sparked the issue and I’d be interested in hearing what others think of your first question. 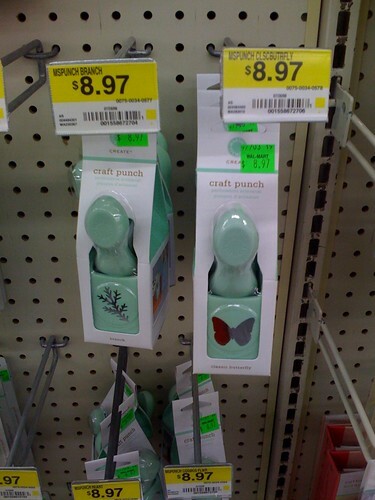 So everyone: What do you think of buying craft supplies at Wal-Mart? i don’t think you can make “indie” goods directly sourced from one of the biggest and worst corporations in the universe. it’s impossible to live in a utopia — but it’s possible to avoid the worst of the worst. Agreed. The reason why these products are “a few cents cheaper” is because they were made by slaves in third world countries. The rapid economic decline of this country and more specifically our own beloved Detroit can be attributed directly to America’s embrace of companies like Wal-Mart. I think that a big part of redefining sustainability, consumerism and the future of our city is figuring out ways to keep the money flowing down here, among artists, the DIY community and other non-evil entities. Dollars spent at box stores seldom find their way back to us. How about a Handmade Detroit post about locally owned & non-profit/charity stores for craft supply shopping? For example, thrift stores are treasure troves of unique, vintage fabric. Also, Arts & Scraps in Detroit has tons of cheap art supplies, most of which are recycled, and money spent there goes to help a great cause. 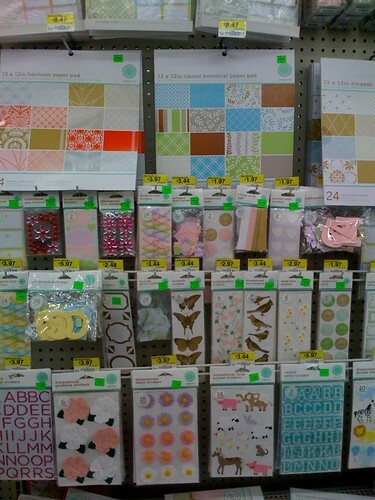 If you have a specific crafting tool on your shopping list that you must have, but, like Martha’s line, is made in China and over-packaged in landfill waste, consider shopping at one of the local craft/scrapbooking supply shops. Paper Tales, on 9 Mile in Eastpointe, is a favorite of mine. Hey guys- Steph already mentioned it, but this post was merely informational. posting about anything is always indirectly promotional, there’s no way around it. there are so many spiderwebs a thread like this could take, being open to critique is necesary… and it’s a really important issue. Everyone, I appreciate the feedback. Please don’t misunderstand our tone — yes, of course, we want to talk about it, that is why we invited more discussion. I must point out that our blog is read by not just Detroit, or for that matter big city crafters, but by crafters from all over Michigan (and beyond). For makers in these smaller towns, buying supplies from WalMart may be their only option — or being able to buy the Martha Stewart line of products in person might be important to them. From our reader survey, I can tell you that a majority of our readers buy 50 percent or more of their supplies from a mass retailer (not nec. WalMart, but a large chain nonetheless); 40-ish percent reside outside of metro Detroit. Is there is room in craft/handmade/DIY for crafters without an overtly social/political agenda? I think so. To extend this idea … I also believe that the act of working with your hands, giving handmade gifts, wearing something you made, etc. can be transformative on many different levels that aren’t political liberal. (For example, raising self esteem/confidence, meeting new people/community building, connecting you to family, leaving your mark on the world, building your skills/self-reliance, slowing down/learning to enjoy the process, the list goes on and on …). I would hate to see this kind of non-political change dismissed or discouraged. 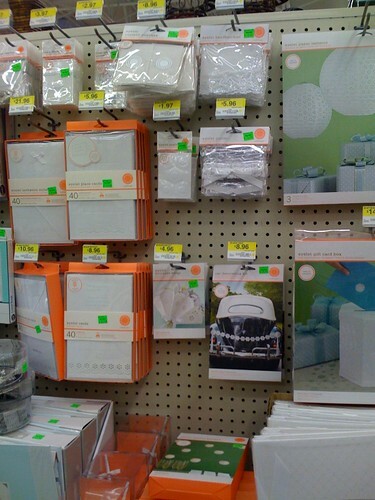 What is the difference between shopping at Michael’s (the other MS carrier) vs. WalMart? What about buying Martha Stewart products in general? Does anyone know the brand’s footprint? Are there any craft supplies designed with up-cycling in mind (thinking here of Cradle to Cradle supplies vs. using re-claimed stuff for supplies)? I think it’s an excellent idea to post more indie supply sellers in our link list. Please post any more you know in the comments. Also, I just want to throw a disclaimer out there: My views may not reflect the those of the other HD ladies! Good point, Steph. Do the overwhelmingly transformative aspects of crafting that you mentioned cancel out the damage done by buying the supplies at big box stores? we’re both from the same small corner of CT). But on the other hand, her products are largely made in China, she has exclusivity deals with a few of the more sinister big box chains, and much of what she sells is overpackaged in money saving, but cancer causing, PVC plastic. Meanwhile, her empire is one of the most successful in American history. The woman is a billionaire. She can more than afford to have her products manufactured in the US, provide economic stability, healthcare and retirement benefits to hundreds, and pony up a little extra for environmentally friendly products and packaging. Hell, I can think of a few shuttered warehouses and factories around here that she could buy and rehab for a song! It would make her a hero and, hopefully, a trailblazer. So I kinda feel like — Ok, Martha, you’re a smart, classy broad — what’s the holdup? Or do you and your shareholders just want to make as much money as possible? The fact that the only option, for many, for buying craft supplies is a big box store… true as that may be, I still think that it is a tragedy. These box stores (Michael’s, Jo-Ann, Wal-Mart, whatever — there is precious little difference) have done so much harm to our communities and quality of life. Mary is right, they destroy far more jobs than they create. In many cases, the reason why a big box is the only option is because it has already run the small, locally owned shops out of business! Furthermore, the architecture of these boxes is imposing and utterly uncharming, and pays no regard to the architectural style of the surrounding community. They’re all freakin’ eyesores inside and out, and oftentimes physically inaccessible unless you use a car to get there. Tell me — would you want to live across the street from one? So — what about all us well meaning DIYers who just need a few yards of ribbon or a couple gallons of paint? I don’t know. Hard I try to avoid spending money in the wrong places, you’re right, sometimes there really is no other option. But the marks of a society depending solely on corporate profits and outsourced labor are too strong these days, especially here in southeast MI. Every new big box is another shuttered factory, another house foreclosure, another dozen homeless men and women spending the night on the abandoned lot over on 3rd street. It’s not even about politics. I mean — what do you think? Is the situation dire enough to where we can live without the sparkly stickers? I like sparkly stickers, too, believe me! And I’m with you, I don’t want to see any crafters or DIYers discouraged, ever. well said melissa. very! it’s so hard to walk the line. but the line wouldn’t be there in the first place without these moster-companies. i think all politicians, corporate giants, and schoolyard bullies have one thing in common: power! once you have it, you don’t want to lose it. you’ll do whatever you have to to stay on top. period. i guess my sadness lies in hipster capitalism supplanting revolutionary power. like so many “cool” things in contemporary culture, crafting has been co-opted by trend marketing. but, that’s how our world is now. one giant edgy ad campaign. but at the same time — we all have to eat, i know. bottom line, wal-mart grosses me out. so does martha stewart. knowing what i know of their business practices i could never add to their incomes. ever ever. people always overestimate the income of MSLO. Stewart herself is no longer a billionaire, and most of her wealth is on paper only. The company earns in the low tens of millions each quarter. It is so small that it doesn’t fit the criteria of small businesses on fortunes best companies to work for list. In short, it is by no means one of the most successful companies in the US.